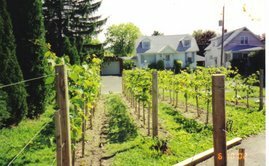 Backyard Vineyard & Winery: Budbreak -A time of new beginnings and WORK! 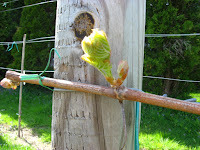 The vines broke bud back in May and from that point on they screamed ATTENTION, NOW!! I had sincerely intended on writing this post by mid-May, but my vines would just not have it. Like little children awakening from a nap, they began to cry for my constant attention and care. I began "changing" them weekly, that is spraying them with sulfur and copper to protect them from the onslaught of fungal diseases like powdery mildew and black rot. Then of course they need "discipline" and "training". You see grapevines love to push the limits as they grow, sprawling up and out, here and there, wanting to grow their shoots long. I, as any good grower would, need to keep them in line by setting limits. That is, by tying them to the trellis and keeping them looking neat by trimming their suckers and water shoots. Oh they fight, but eventually they settle down and when the trellis is full of a new healthy canopy of green, they have shown me that they still love me. 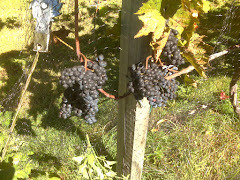 Now, if only they'll cooperate right up till harvest. Well it is a labor of love you know and after all, they are still my babies.